Editor's note: Mel Robbins is a CNN commentator and legal analyst. She is the founder of Inspire52.com, a news and entertainment site for women, and author of "Stop Saying You're Fine," about managing change. She speaks on leadership around the world and in 2014 was named outstanding news talk radio host by the Gracie Awards. Follow her on Twitter @melrobbins. The opinions expressed in this commentary are solely those of the author. (CNN) -- The video showing Ray Rice punching Janay Palmer inside an elevator was released Monday. And everyone should watch it. In fact, you should show it to your daughters and your sons, as hard as it is to witness. We already knew that Ray Rice punched his wife and she was knocked unconscious, but when you witness the violence you can no longer turn this "incident" into a tiff between drunk lovers or blame the victim: Janay Palmer. Many people had done just that, and speculated on whether she had provoked Rice. The Baltimore Ravens blamed her when they suggested in a tweet that she had played a role in the incident. The tweet, which was taken down on Monday, read: "Janay Rice says she deeply regrets the role that she played the night of the incident." What role was that exactly? Her role as punching bag? Her role lying unconscious? Her role, as this FOX News anchor said after seeing her punched, "in not taking the stairs." Domestic violence usually takes place behind closed doors; that's because batterers typically hide the abuse. No surprise that Rice didn't assault her in the lobby but waited until they were alone in the elevator before he punched his wife. Victims are afraid of their batterers, and now that you've seen the video, you understand why. I'm sure Palmer was terrified of getting him in trouble with the police or the NFL, but thankfully Ray Rice was wrong: They weren't alone, the world was watching. We were watching as he knocked her cold onto the floor with one punch to her face, causing her to smash into the railing of the elevator and fall lifeless on the ground. We were watching as he dragged her limp body partway out of elevator and dumped her with her skirt up and bum showing to the audience in the lobby. We watch as he appeared to kicked her with his shoes on, perhaps to see if she would wake up. And as she regains consciousness, we watch her sit up then flop back down, head between the elevator doors as they are about to close. It is a stranger who kneels down and cradles her. Not only is the punch shocking, but Rice's complete lack of care, remorse or concern for her as she's lying unconscious is what sticks out. He's a batterer and she's a victim of abuse. I'm sure he apologized later to her and felt sorry. That's part of the cycle of abuse: violence then a honeymoon period, only to be followed by violence again. Katie Ray-Jones, president of the National Domestic Violence Hotline and the National Dating Abuse Helpline, has said an abused woman will leave a relationship approximately seven times before she leaves for good because of the psychological damage that batterers inflict. There are countless reasons victims recant their stories or stay in an abusive relationship: low self-worth, financial worries, fear, even love. Instead of wondering why a victim stays, the world would do better to focus on punishing the batterer. The NFL, faced with new evidence that proves Janay Palmer had no role in this incident, regardless of what she might have said to downplay it, are doing what they should have done after the first video showed her unconscious on a lobby floor and Rice admitted he had assaulted her . The Ravens just released Ray Rice and NFL Commissioner Roger Goodell suspended him indefinitely. It's sad that it takes a Pennsylvania daily newspaper to remove a child molester from the locker rooms of Penn State and TMZ Sports to remove an admitted batterer from their ranks. The NFL completely screwed this up from the beginning by interviewing Janay Rice with her batterer present and not using common sense and seeking the full video to begin with. The victim blaming has to end and the world must learn a lesson for the sake of all victims of domestic abuse. NFL officials knew what he did, but it was only when they had to watch it that they did the right thing. Janay, wherever you are, and despite what some will say, you need to know you have done nothing wrong. You are a victim. And when Ray Rice made the choice to punch you, he made a choice that will forever determine his fate. NFL teams have unanimously endorsed a new personal conduct policy for all employees after talking with experts on domestic violence and sexual assault. The San Francisco 49ers released defensive end Ray McDonald amid allegations of sexual assault. The NFL confirmed it will investigate. Arizona Cardinals running back Jonathan Dwyer has been indicted on a felony charge of aggravated assault stemming from two July arguments with his wife. Minnesota Vikings star running back Adrian Peterson learned he will be suspended without pay for the rest of the 2014 NFL season. A newly released video shows the now-wife of Ray Rice lovingly nuzzling him shortly after he knocked her out cold at a casino in New Jersey. It took seven months for the video of Ray Rice punching his now-wife to become public. Here is a timeline of key events in the Rice story. The NFL's history of punishing players in domestic violence cases is as complicated as the legal cases themselves. Opinion: It's really hard to take anything in sports seriously when you know the bottom line is always about maximizing the top line revenue. NFL officials were unprepared and slow to respond when video surfaced of Ray Rice hitting his fiancée, President Obama said. Before Ray Rice knocked out his then-fiancee, Janay Palmer, little was known about them. But there's more to their story than the assault video that has left many stunned. Janay Rice, wife of suspended NFL player Ray Rice, apparently posted a statement Tuesday on Instagram calling the situation a "nightmare." Ray Rice is a human who made a mistake that he'd never made before and that he won't make again, wife Janay Rice said in an interview. Since Roger Goodell took over as NFL commissioner in September 2006, he's had his hands full. The NFL has established a six-game unpaid ban for personnel who violate the league's policy on domestic violence. 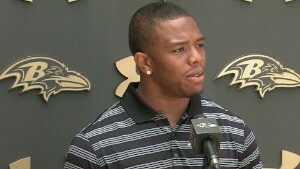 Ray Rice told reporters, "You know that's not me," he said. "You know that's something I have to live ... with the rest of my life."